...Others just do this kind of stuff in their free time. I have never claimed to be cool, just FYI. My little sister Rachael is redoing her bedroom (so far, the only thing we've done is repaint -- light turquoise/seafoam blue, with one striped accent wall). 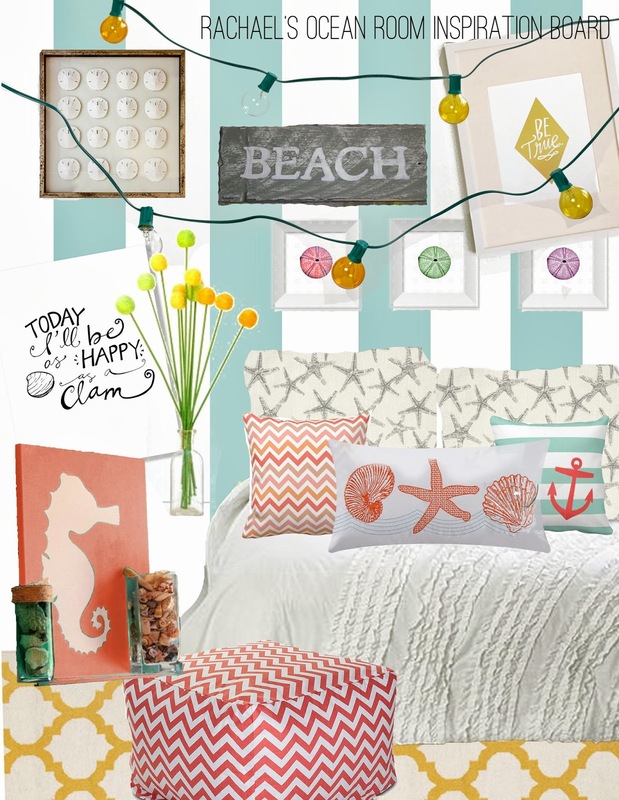 She's wanted an ocean-themed room for years now, so I decided to try to come up with something that was beachy without being cheesy (aka no fish everywhere, no shells plastered to every mirror/lamp, no "life's a beach" signs) and also age-appropriate. Rachael is 14, so I didn't want anything too "young" but I did want things to still look fun and not too grown up. My mom's stipulation was that it has to be able to ditch the beach stuff easily in case Rachael changes her mind down the road and doesn't want ocean anymore. I think this will work since you could switch out a few pillows and some wall art and give the room a different feel.